This carefully crafted ebook: “J. 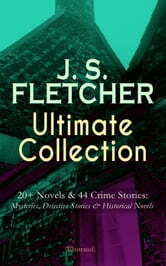 S. FLETCHER Ultimate Collection” is formatted for your eReader with a functional and detailed table of contents. Joseph Smith Fletcher (1863-1933) was an English author, one of the leading writers of detective fiction in the Golden Age. Content: Novels Perris of the Cherry Trees The Middle Temple Murder Dead Men's Money The Talleyrand Maxim The Paradise Mystery The Borough Treasurer The Chestermarke Instinct The Herapath Property The Orange-Yellow Diamond The Root of All Evil In The Mayor's Parlour The Middle of Things Ravensdene Court The Rayner-Slade Amalgamation Scarhaven Keep The Charing Cross Mystery The Kang-He Vase The Safety Pin Sea Fog The Borgia Cabinet The Mill House Murder In the Days of Drake Where Highways Cross Short Stories Paul Campenhaye – Specialist in Criminology The French Maid The Yorkshire Manufacturer The Covent Garden Fruit Shop The Irish Mail The Tobacco-Box Mrs. Duquesne The House on Hardress Head The Champagne Bottle The Settling Day The Magician of Cannon Street The Secret of the Barbican and Other Stories Against Time The Earl, the Warder and the Wayward Heiress The Fifteenth-Century Crozier The Yellow Dog Room 53 The Secret of the Barbican The Silhouette Blind Gap Moor St. Morkil's Isle Extra-Judicial The Second Capsule The Way to Jericho Patent No. 33 The Selchester Missal The Murder in the Mayor's Parlour Mr. Poskitt's Nightcaps (Stories of a Yorkshire Farmer) The Guardian of High Elms Farm A Stranger in Arcady The Man Who Was Nobody Little Miss Partridge The Marriage of Mr. Jarvis Bread Cast upon the Waters William Henry and the Dairymaid The Spoils to the Victor An Arcadian Courtship The Way of the Comet Brothers in Affliction A Man or a Mouse A Deal in Odd Volumes The Chief Magistrate Other Stories The Ivory God The Other Sense The New Sun The Lighthouse on Shivering Sand .. Joseph Smith Fletcher (1863-1933) was an English author, one of the leading writers of detective fiction in the Golden Age.